Do you love creating die cut scenes? We do too and today Kittie has a great idea for a beach scene starring one of the newest Leading Ladies, Beach Lady (available Sunday, June 10th). Head over to our new blog to check it out! Did you know that you can combine Distress Oxide inks to create new colors? Watch Sandy do it while she creates patterned clothes with new Leading Ladies sets coming on Sunday, June 10th! Head over to our new blog to see more! Is there someone in your life who deserves a trophy? Brandi made a DIY trophy with paper and a brand new Leading Lady, Woodsy Lady (available Sunday, June 10th). See more on our new blog here! ...check out our new blog HERE! I've lived near the sea nearly all my life so I adore aquatic/nautical themed cards and the instant I saw this gorgeous coral die by Alexandra Renke, I HAD to have it for a message-in-a-bottle idea that immediately came to mind. LINK: Enjoy in HD on our YouTube Channel HERE! Thanks for subscribing and giving us a thumbs' up! Use the recommended sandwich (in the Gemini Jr. manual) for cutting regular low profile dies. Make sure your watercolor work is completely dry before die cutting, to ensure sharp/consistent cuts through the paper. Use just the two cutting pads + a card stock shim, for embossing with regular/standard embossing folders. Hi everyone! Happy Satur-YAY! It's Carissa with you here today. I'm so glad you've stopped by today. I'm celebrating the weekend by getting my craft on. 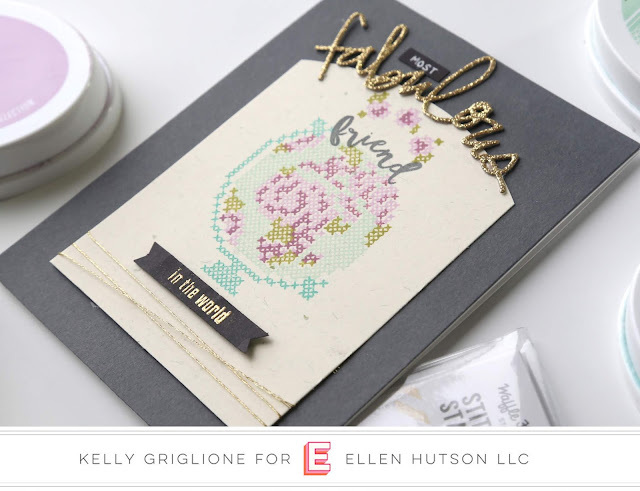 I have a project featuring lots of layers and the beautiful new Stitched Together United We Flourish stamp set from Waffle Flower and Essentials By Ellen. It was my goal to create a lovely layered effect, without my card getting too bulky for mailing. I did this by layering directly on my card base. I also combined stamping and patterned papers in to my layering, which are great ways to add layers and not increase the bulk of your card. The Stitched Together Stamp Set is a stamp layering stamp set. 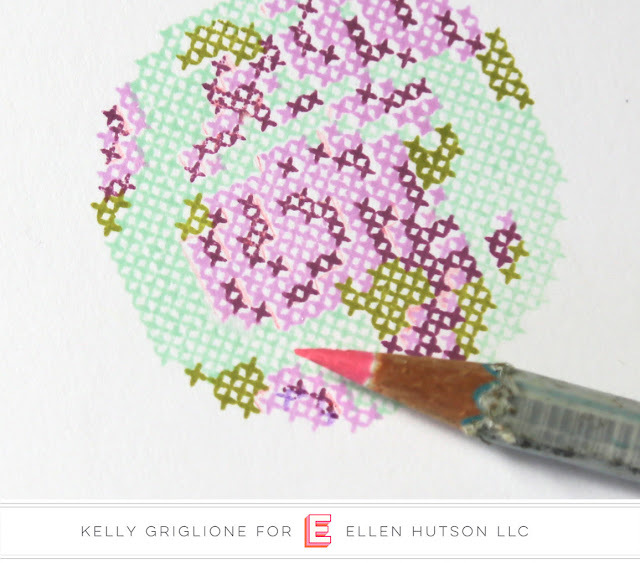 There are several stamps that, when layered together, give you a beautiful stitched floral globe image. I love that these stamps are easy to line up. In fact, I didn't even have a layering guide when I stamped this and I was able to nestle these stamps right in to each other and create a beautiful layered stamped image. I did add some dimension to my card by stacking up several plain white die cuts behind my stamped globe image. This is a great way to add dimension and give your stamped piece a very substantial feel on the front of your card. Be sure to check out today's video tutorial below. I'll be walking you through the creation of this card and give you some tips and tricks along the way. Thanks for stopping by today. I hope you've enjoyed this project and I hope it has inspired you to create something handmade on this beautiful Satur-YAY! If you make something today, be sure to tag us and use #EllenHutsonSaturYAY so we can see what you're up to. You can watch this video in HD on our YouTube channel by clicking HERE. Don't forget to like this video and subscribe while you're there so you don't miss any of our paper crafting video tutorials. Kickoff Summer with a Crafty Sale! Celebrate the unofficial start to summer with a gift from us! Friday through Monday, use the code betterthan to take 20% off your order of $75 or more*! *Code cannot be used on Mama Elephant products released in the last 90 days or the BCRF Fundraiser. Additionally codes cannot be combined and are valid on in-stock items only. Not good on previous purchases. Sale ends May 28th, 2018 at 11:59PM PDT. Please note, we anticipate that the number of orders will alter our quick shipping time so please expect that your order may take up to a week to ship. And please understand that we will not be able to combine orders. Lydia Evans demonstrates some great tips for spacing & stamping layered images to create a perfect background! Hello everyone! It's Lydia here and I'm so excited to be sharing my very first video here in the Ellen Hutson Classroom! So today I'm sharing a card made with the very pretty and EXCLUSIVE United We Flourish Stitched Together Stamp & Die Set with Waffle Flower. The set is so pretty and unlike anything I have in my stash. To start I drew pencil lines all over a card panel so I could get my images spread out evenly. I also create a 'guide', by stamping the world image onto a piece of cardstock and cutting around it, this really helped when positioning stamps on the first layer. 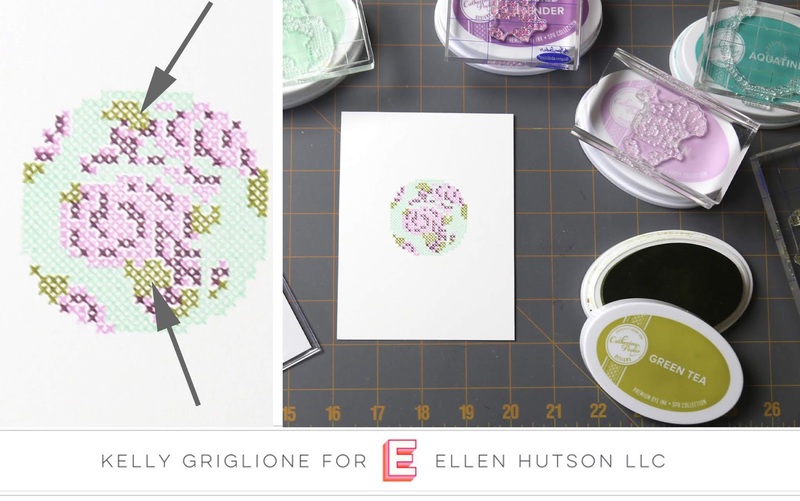 I then placed my gridded cardstock panel into my Misti, placed the guide where I wanted to stamp the image, placed the water layer in place over the guide, removed the guide and then stamped the image into position. I used Altenew Mountain Mist Ink for the water layer. Once I had stamped all of the water images I moved on to Flower Layer 1 which I then stamped using Pinkalicious Ink. Next up I went onto Flower Layer 2 which I used Rubellite Ink. The Leaves layer was the easiest to stamp as this just goes where no other ink colour has been before, I used Olive Ink for this. Watch in HD on our YouTube Channel HERE! Thanks for sharing some comment love and a thumbs up with Lydia there and be certain to subscribe to our channel for other fantastic videos! Thanks so much for joining us today and I'll see you again soon! Watch in HD on our YouTube Channel HERE! Thanks for sharing some comment love and a thumbs up with Laurel there and be certain to subscribe to our channel for other fantastic videos! Kelly has 4 gorgeous ways (and a bunch of tips & tricks) to use the new United We Flourish stamps & die combo, Stitched Together by Waffleflower. The stamp set contains one stamp for each of the 5 colors that will make up the globe. To help you build your masterpiece in the easiest way, the stamps are numbered in the order that you stamp them. Before I started stamping I got out the five ink pads I wanted to use, and put the coordinating blocks of stamps on top of the ink. This made it easier for me to make subsequent globes, as I already had everything laid out. The first stamp is the ocean, which I stamped in Catherine Pooler Ink's Mint To Be. This one is easy because you don't need to line anything up. Now it gets a little more detailed, but I'm going to walk you through what worked for me. The lighter colored portion of the flower is next (Catherine Pooler Ink's Sweet Sixteen). I picked two areas that left no question where the cross stitch should go, since it was surrounded by ocean from the first stamp. These two areas are highlighted with the arrows on the left. TIP: Initially I only used one area to line up my stamp, but found that if you didn't have your stamp block completely horizontal, stitches in the other sections would be off. Using two areas to line up your stamp helps avoid this issue. Now it's time to add details/shadows to the flowers with a darker color, Sugared Lavender. To line this one up I focused on the main rose area with the circular pattern. When you hold the stamp over the image, the stitches visually fill in the rest of the flower, making it easy to position. The leaves, stamped in Green Tea, will complete the world. I focused on the two larger clusters of leaves to line these up. I thought this one would be a little easier than it was because the leaves should be filling in the only remaining spaces, but since my ocean color is so light there wasn't a ton of contrast to help guide me. Just make sure you choose two different areas to line up your stamp with. Finally, you get to stamp the base of the globe. The important thing to remember on this step is to make sure to allow an even amount of space all the way around the semi circle. The first time I stamped this I lined up the stand so that it was touching the bottom of the globe. Well, that doesn't make sense because a globe should be suspended so it can spin. You can line up the stand with the bottom of the globe to start with, but make sure to then move it away from the globe one row before you stamp. Now you're done! Let's take a look at some finished examples, and then I have a few more tips before you go. Didn't this globe turn out so well?! The beauty is that since the main image is so interesting and impactful, you really don't need much else to complete the card. You'll see this in all the examples. For this card I wanted everything else to be white so the cross stitch really stands out. The panel is sewn onto the card base with a piece of lace from a tablecloth that had a hole in it (25 cents at a garage sale!) in between. I was really excited to find this sentiment from Up the Happy, as it actually has the word "world" in it! Score! I split up the sentiment and stamped part of it above the globe, part of it embossed in gold below the globe, and the rest of it stamped below that. This card is for my most fabulous friend in the world, but it could also be for the most fabulous mom in the world (especially if your mom cross stitches), or teacher in the world (globes are educational!) I stamped the globe on a cream base to give it a more homespun feel. The word "most" is handwritten on a piece of black cardstock. Remember, if you don't have the right stamp, sometimes you can just write it yourself! 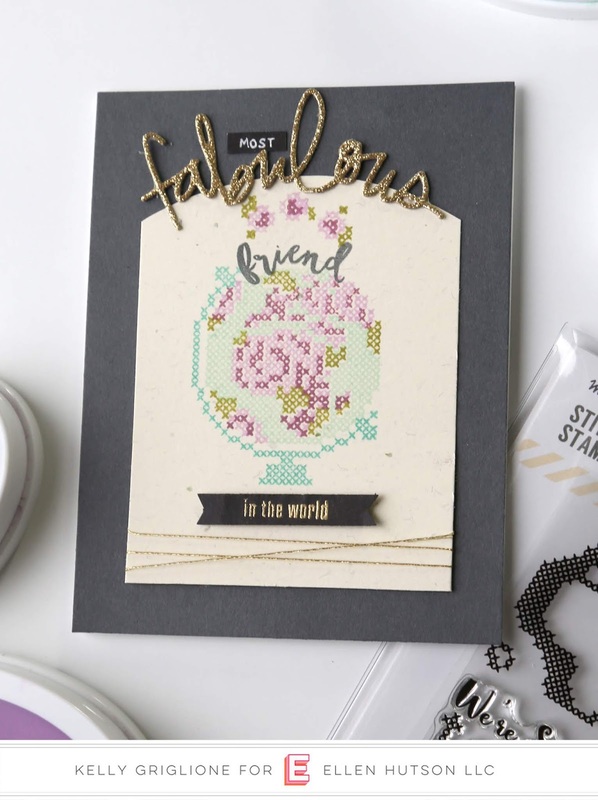 "Fabulous" is from Totally Fabulous by Julie Ebersole, "friend" is from Oh Deer by Julie Ebersole (retiring soon), and "in the world" is a portion of a stamp that comes with this set. Did you notice those cute little cross stitched roses at the top? These stamps are also included in the set. There is only one flower image, but you can rotate it and change up the leaves like I did here to make it look like different flowers. The sentiment on this card comes with the set, I just broke it up a little to be above and below the globe. I didn't have the right color of aqua for the card base, so I decided to use the same color ink that I used for the globe's stand. Can you guess what stamp is around the border? It's the pair of Christmas trees from Holly Jolly by Julie Ebersole! I just needed a stamp that was solid so I could turn most of the margin aqua. I ended up liking the sharp angles of the trees when they were all stamped together because it adds some interest to the background. The panel is inked around the edges with the same ink from the darker floral section, and I blended some of the ocean color around the edges of the white panel. The last cross stitch stamp that I hadn't used yet is the cute heart. I decided to literally stamp the love around the sentiment. To create the feeling of an embroidery hoop to frame the stitched hearts, I die cut the circular frame with holes in it from Mirror, Mirror by Brandi Kincaid. The holes were just begging to be stitched through, which supports the needle work theme of these projects very well. This would be such a cute tag, or you could also attach it to the front of a card. Next I'd like to share a few tips that I came across while making these projects and playing around. One tip for making sure you align the different pieces of the globe just right is to keep the stamp perfectly horizontal. Originally, I used some circular stamp blocks, which made it more difficult to keep the image horizontal. Lining up the image was much easier when I switched the stamp to a rectangular block. If you didn't keep your stamp horizontal, you may end up with a few rows or columns of stitches pulling away from their neighbors. You can see this here, were the light purple columns of Africa are stamped too far to the right, leaving several white gaps. When this happened, my heart sank and I really didn't want to give up on the image since the rest of it was pretty well aligned. So I sharpened my colored pencil and drew a very thin line through the white space. You'll see that even though the color is not close at all to the light or dark purple, as it's pink, just taking away the white space makes the problem start to go away. Here I filled in all the white spaces in Africa, and now it doesn't look off anymore. It would look even better had I used a purple pencil! My final tip is to think about using a MISTI. Although you can absolutely stamp it freehand, the MISTI is great if you were planning on making more than one globe like I did here. I only have one MISTI so I had to space it out carefully. The trick here is to always use paper in the same dimension as the one you start with. As long as every future panel is 4" wide for this particular set up, I'll be able to stamp my water in the bottom right corner, stamp the light florals in the bottom left corner, flip the paper over and stamp the darker florals in the upper left corner, and finally stamp the leaves in the upper right corner. I'm going to make a large batch of these to have on hand while the stamps are still arranged on my misti. Well, what do you think, folks? Are you ready to try this set out? I can't wait to play around with different color combinations, especially now that it's set up on the misti. Be sure to mark this post to come back to once you are ready to stamp! 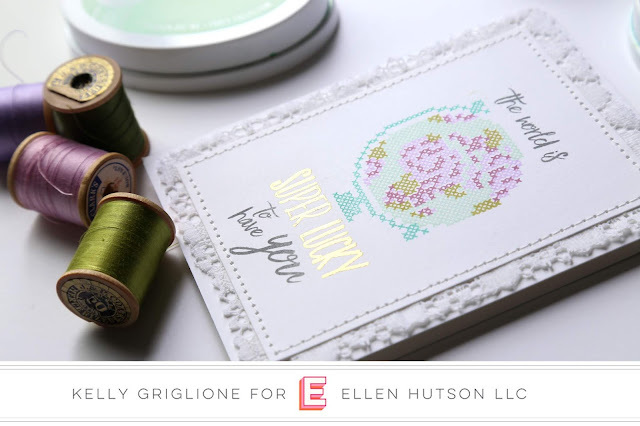 Are you a fan of needlepoint or cross stitch but just don't have the time it takes to complete a project? If so, this stamp set is for you! 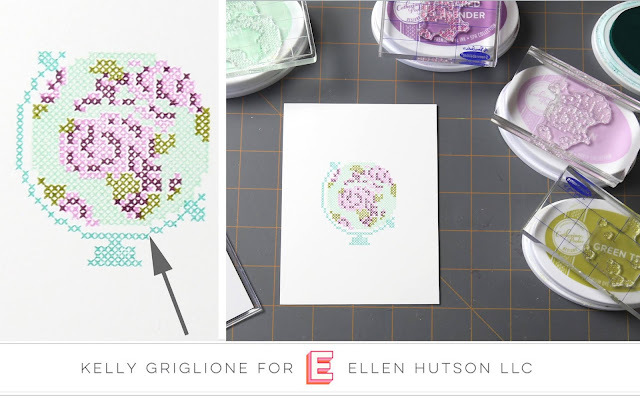 This beautiful cross-stitched globe stamp is an elegant pattern that comes together in minutes when stamped with your favorite inks to create a stunning card or piece of wall art! In 2016 we began celebrating our 10th anniversary with the theme United We Flourish. What does United We Flourish mean? It means that our company would not be here without the amazing companies we work with, the designers who create stunning projects showcasing the wonderful products being created AND you, our fabulous customers! YOU are such a vital part of our creative community - you inspire & encourage us! Your response to United We Flourish was overwhelming and heartwarming. We heard repeatedly from you that you appreciate how our little company works together with the other manufacturers we carry to bring you their products and education showing how to use those products. To thank you for your constant support and encouragement, we have partnered with some of our friends to offer exclusive limited edition stamp & die sets!!! These sets will be available for a limited time (most likely 3-6 months) after each release, depending on how quickly you snap them up. The themes of these stamps sets are uplifting and fun. 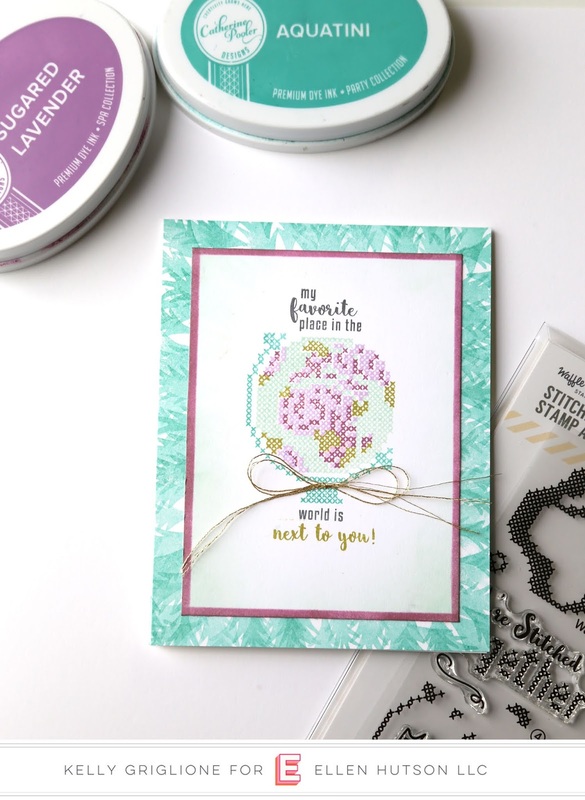 And today we are thrilled to share the latest United We Flourish set, Stitched Together by Waffle Flower! Today we are thrilled to share some irresistible projects from some talented ladies! Grab a cuppa and get ready to be inspired by this talented group! Make sure to leave comment love along the way because two randomly selected commenters will win a $30 gift certificate to the Ellen Hutson shop! To enter just leave a comment at each blog by 11:59pm PST on May 26th. The winners will be contacted directly via email. Pantone's current color palette is Floral Fantasies and the inspiration behind this month's challenge!! Please join me, Laurel Beard in congratulating Ashwini! She was randomly selected to receive the $50 gift certificate to the Ellen Hutson Store from our last Color Trend Challenge! Congratulations! Please email me at laurelbeard at me dot com to claim your prize! Onto today's challenge! What are you in inspired by in this photo? The colors? The patterns? The images? Whatever speaks to you in this photo is what we want you to be inspired by! We have several amazing designers here with us today that created projects based on this inspirational photo! If you click on each of the designer's names, you will be taken directly to their blog where they will have more information and details regarding their designs and what they were inspired by. All of the supplies the designers used will be listed at the end of this post along with the Challenge Link up so you can play along! How amazing are these projects? I love the different interpretations taken from the inspiration photo! Each project is a work of art! PIN AWAY as they are definitely pin worthy! Thank you ladies so much for joining us today! NOW IT'S TIME WHERE WE INVITE YOU TO PLAY ALONG IN OUR CHALLENGE! To participate, simply use any Essentials by Ellen product and create a project based on the above inspirational photo. You are not limited to just creating handmade cards. You can create altered art, mixed media, art journaling pages, home decor, scrapbooking layouts, etc... Whatever your heart desires is what we want to see! We will select one participant randomly to receive a $50 gift certificate to the Ellen Hutson store! To enter, please add your projects to the Inlinkz link up at the end of this post. The Pantone "Floral Fantasies" palette is everything that our dreams are made of this spring! The palette is a dreamy collection of pastels with a bold, rich navy and the color of the year, Ultra Violet! How can you use it? Check out this awesome card & video from Therese! Watch in HD on our YouTube Channel HERE! Thanks for sharing some comment love and a thumbs up with Therese there and be certain to subscribe to our channel for other fantastic videos! We've compiled a list of these gorgeous colors in inks, markers, cardstock and more so grab your favorite spring stamps and see what you can create! And we'd love for you to join the Color Trend Challenge so come on back this Thursday! Celebrate the women in your life - mothers, sisters, friends - and celebrate yourself too, with a gift from us! Sunday through Tuesday, use the code momsday18 to take 20% off your order*! *Code cannot be used on Mama Elephant products released in the last 90 days or the BCRF Fundraiser. Additionally codes cannot be combined and are valid on in-stock items only. Not good on previous purchases. Sale ends May 15th, 2018 at 11:59PM PDT. It’s Justine here for another post featuring the new May Release! What is your favourite product so far? I decided to use my favourites from this release - Parcel Box and Mondo Sakura to create a fun gift card holder. Watch in HD on our YouTube Channel HERE! Thanks for sharing some comment love and a thumbs up with Justine there and be certain to subscribe to our channel for other fantastic videos! I wanted to create a card that held a gift card that I couldn’t see. I always seem to have to create my cards around the colour palette of the gift card itself and sometimes I just want to create. This little box is perfect for that! I used non-permanent adhesive to adhere the box to the front of the card so it stays put but won’t rip the black and white card base when the receiver takes it off. How do you pick your colours for flowers? I usually google an image of the flower itself (if I know the type) or I just go wild and use whatever. Do you prefer to stick to the natural colour or just go with it? It was wonderful joining you again this month and I look forward to creating even more fun inspirational cards over on my channel throughout the month! Watch in HD on our YouTube Channel HERE! Thanks for sharing some comment love and a thumbs up with Carly there and be certain to subscribe to our channel for other fantastic videos! Hi, it’s Jan Tinklenberg, and I was so geeked to learn of this release and the new Mondo Sakura set by Julie Ebersole! 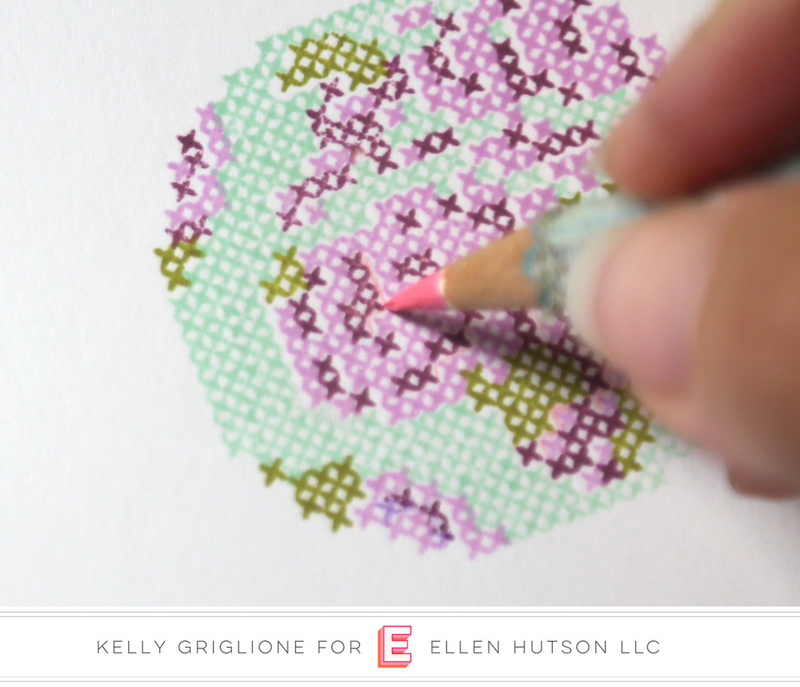 I love Julie’s stamps, especially her Mondo floral sets, and I knew exactly what I wanted to do with this set, which was to create a bokeh background using Copic markers. I started out by stamping the flowers with my MISTI with Memento London Gray, because I wanted a soft look, not quite light enough for line-free coloring, but not as dark as a black would be. I looked at a lot of photos of sakura flowers to choose my colors. I colored the flowers with Copics, using the second red violet blending group, which starts with RV10 and goes to RV19. I also used R59 for the deepest red. The leaves were colored with YG21, YG23, and YG25. I used the Toner Grays, T0 and T1, to add some shadows on the petals. I used the colorless blender (0) to help blend the colors on the largest flower. Once I got the flowers colored in, I laid in a soft background using the Copic Toner Gray marker assortment, with darker grays behind the flowers, moving out to the lighter grays towards the edge of the card stock. I then started adding different sizes of circles to create the bokeh effects with the lightest RV10, some of the slightly darker grays, and I added some blender pen circles to push the color much lighter. I overlapped circles and made sure to have some go off the edge. Grouping background elements in the center of the card stock will make your piece look crowded and awkward. The trick of creating a nice background is to make it look like you are looking through a window, with background elements only partially seen around the edges, or like cutting a piece of patterned fabric, where elements will be on the edge and cut in half. Once I finished coloring, I cut the piece using the largest MFT Stamps Wonky Stitched Rectangle die and popped it above my card base with a white Scrapbook Adhesive 3-D Creative Sheet. The final touch in coloring was to add some white highlights to the stamens using a Sakura Gelly Roll 05 white gel pen. I used the matching dies to die cut the word “beautiful” from Bazzill Card Shoppe Candy Bar card stock and adhered it to the card front with a Sakura Quickie Glue Pen. I stamped the words “you” and “are” from the Mondo Sakura set in Versamark on the same color card stock and heat embossed in Hero Arts White EP, then cut it in a thin strip and mounted it above “beautiful” on the card front. I added some Pretty Pink Posh Sparkling Clear sequins to the card for a little bling. Thank you for geeking out with me over this set, and I hope you have as much fun coloring it as I did! Watch in HD on our YouTube Channel HERE! Thanks for sharing some comment love and a thumbs up with Emily there and be certain to subscribe to our channel for other fantastic videos! We're humbled to be part of a very VERY special hop, coordinated by Lea Lawson . Please visit Lea's blog post HERE to learn more details about this incredible, deeply heart-felt effort! We're honored to be among these fine sponsors! DONATE! - directly to Layton's Legacy YouCaring Fundraiser. For every $5 donated, you will be entered into the drawing for one of the prizes above!! All winners will be drawn from donations made thru the YouCaring Site. **Prizes will be drawn and announced on Lea's blog on Saturday, May 19th**. SHARE! - We fully understand that not everyone is able to donate, but sharing about the fundraiser gives it more visibility! Please feel free to share the YouCaring Link or this post on all your social media outlets! CREATE! - this is also a card drive, and if you'd like to create a card using the theme/moodboard below, that would be so lovingly welcomed! Lea will be including these handmade treasures with the giftcards when she hands them over to the NICU social worker, and her dream is that the NICU will be covered in beautiful creations inspired by Layton!! Link them up HERE, and then please email Lea directly at lea@lealawsoncreates.com to get the address for sending - and note that she will need them to arrive by May 31st. Based on Lea's inspiring mood board above, Julie will be demoing a Starbucks Gift Card Packaging LIVE tonight, 7:30 PST on the Ellen Hutson Facebook Page HERE! Please join us! 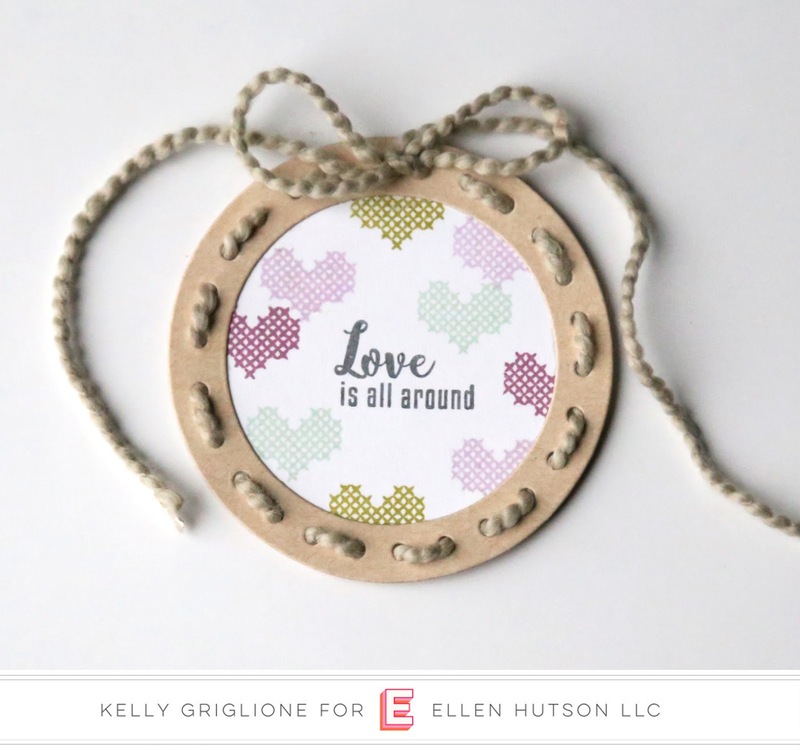 Nesting Paper Punch, Circle 3/4"
We are so happy to have 3 of our talented design team here in The Classroom today to share their creations with the latest Essentials by Ellen stamps & dies! Check them out (and just click on the pictures to see more)! Thanks so much for stopping by and MONDO thanks to Elena, Ardyth & Michele for sharing their talent with us! Watch in HD on our YouTube Channel HERE! Thanks for sharing some comment love and a thumbs up with Julie there and be certain to subscribe to our channel for other fantastic videos! P.S. Do you love the new Plaid Maker stamp set as much as we do? It will be available tomorrow, Sunday the 6th at 9am PST! Hi there! Elena here with a girly take on a graduation party, using the new Essentials by Ellen May release that will be available on Sunday, May 6th at 9am PDT! I love, love, love these new sets! The Plaid Maker set and Monko Sakura flowers don't look like obvious choices for a graduation party, but I hope you love them together as much as I do. I started out with a quote on my letterboard - it made me smile! I also stamped a bunch of the large flower cluster found in Mondo Sakura. It is so gorgeous, isn't it? I put 2 of them together to top the cake, and one, standing upright, made the perfect and most dramatic cupcake topper. I used the letters found in the Block Words dies to monogram each water bottle, and placed them onto a tag included in the Parcel box die set. Speaking of the Parcel box die, I used it to add a gift card to the front of store-bought clear favor boxes. By wrapping the clear boxes in more plaid paper, and adding more floral touches to the fronts of the Parcel boxes, I reinforced my party theme. These favor boxes are my favorite things on the table by far! As a last touch, I created a table sign. I wanted to include a few sentiments to show the grad how great she did! The little YAY on the cupcake flags, and GREAT JOB here are just a few easy ways to celebrate your grad! I hope you like what I created! Thanks for stopping by! To align, or misalign, that is your option! Welcome to The Classroom today! I have the honor of sneaking a few peeks of The Essentials by Ellen May 2018 release coming soon to your craftrooms! I know you're going to love all the new goodies that Ellen and Julie have for us this month! I can’t tell you how happy I was when I saw this Block Words set of dies in the release! I love the 3/4 inch size, the fabulous choice of words, that could be cut from any card stock, or even patterned paper! Julie has also added Totally Random Words Vol. II set to this release! so you can stamp the die cuts, and add an additional script-y sentiment, too! Hello has been stamped leaving just a hint of white for a highlight at the top edge of the letters. Using my Mini-MISTI made quick work of stamping each word until my heart was content! Okay, one more new product peek... are you ready to see the newest, next most wonderful MONDO bloom by Julie set? Introducing...Mondo Sakura! Notice the set contains the words You, and Hello? Certainly they could be stamped on their own, but the Block Words dies include them, to coordinate with this gorgeous set. A few more script-y add-on sentiments are included, too...for the front of your card, or a beautiful addition to the inside! There is a Mondo Sakura die, and bonus the set includes two stand-alone, wonderful, beautiful word dies, too! Okay, I've teased enough! Ready to see how they all came together? Isn’t that stamp just MONDO beautiful? I hope I’ve tantalized you with these products from our May Essentials by Ellen release...even more fun new products will be available on May 6th at 9am PDT in the Ellen Hutson store! Celebrating Moms, Dads & Grads! A season of celebration has begun! Spring is finally here (at least in the PNW) and we are excited to celebrate our moms, dads and grads! We also have a brand new Essentials by Ellen release happening this coming Sunday, May 6th at 9am PDT and it is going to be perfect for your spring celebrations! Use these tips when working with your intricate dies! Hi everyone! Thanks for stopping by! Happy Satur-YAY! We're celebrating the weekend by getting our craft on. I hope you leave here inspired to create! Today I'll be working with some new dies and stamps from Alexandra Renke. We found the beautiful Alexandra Renke products at this year's Creativation trade show and we're thrilled that they are now available in the Ellen Hutson store. The dies are so beautiful and oh so delicate. We fell in love with these beautiful designs. Sometimes working with intricate dies like this can be a little bit of a challenge. They're very delicate and can be challenging to cut...if you don't know the tricks. 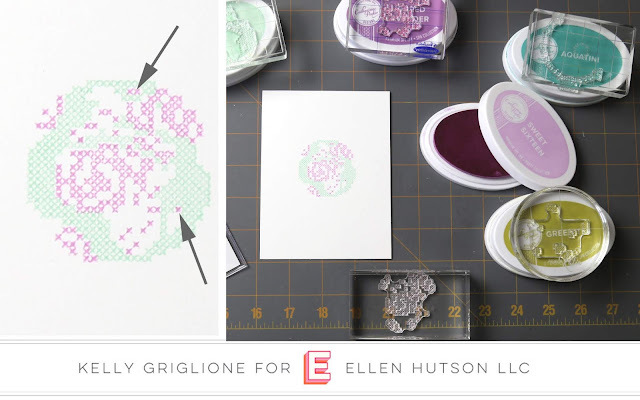 So I'm here today to share several tips for getting great die cut results with intricate dies. I'll walk you through all of these tips in the video tutorial, so be sure to check that out! Start with a lightweight card stock. If you're having trouble cutting through 110 lbs card stock with your intricate dies, you may want to use an 80 pound or 100 pound yardstick instead. If you don't have the color you're looking for in a lighter weight card stock, just die cut from white card stock and color with your favorite marker or ink pad! Today I'm using Neenah Classic Crest Solar White 80 lbs card stock and the new Essentials By Ellen 100 lbs card stock. Add adhesive before die cutting. Adding adhesive to such intricate die cuts can be challenging. That's why I prefer to add a double sided adhesive, like Stick It, to the back of my card stock prior to cutting. This makes it quick and easy to adhere my die cuts when I'm ready. Check your plates. Extremely warped or overused plates may alter the amount of pressure that you get when you're running your dies through your machine. If you're having trouble getting a clean, thorough cut, you may want to replace you cutting plates to achieve more even and consistent pressure. Shimmy and shake. Shims are a great way to get better results when using intricate dies. I recommend metal shims for the best results. Metal doesn't compress like a card stock shim would, so you get even pressure cut after cut. Metal shims are available for both the Gemini Junior and the Big Shot, and I'll show you how to use both of them in today's video tutorial. The right angle. If you're using a shim and you've got good plates and you're still not getting a great cut, try running your die through your machine at an angle. This little trick works great when you're having a tough time getting a clean cut. The infamous pokey tool is a must. They're not really called pokey tools...but I think that's what a lot of us have come to know them as. A craft pick is a great way to eject your die cuts from the dies. Intricate dies tend to get stuck, and getting them out without ruining them is easier when you use the right tools. I find a craft pick is just the right tool for the job. Brush it out. A die brush is also an excellent tool when working with intricate dies. A die brush can be used to eject pieces that remain stuck in the die after die cutting. It can also be used to eject pieces from the die cut itself. Simply roll it over (I like to use a microfiber cloth beneath) to eject the hanging chads. They'll get caught in the cloth beneath and leave you with a nice die cut...without having to pick those pieces out one by one. Stack for dimension. For the love...do not try to put foam adhesive on something this delicate....unless you love to torture yourself. Instead, die cut the same shape several times and stack them on top of each other to achieve dimension...and keep your sanity. Tweezer time. I like to use tweezers to help me place my intricate die cuts on my card fronts. I just find it's easier to pick them up and place them without my fingers getting in my way. So there you have it...my best tips for getting great results every time you use intricate dies. These are tips I use ALL the time and I've shown you all of them in today's video. I've kept today's card rather simple, allowing the beautiful die cuts to be the star of the show. And I love the way this card turned out. When you have die cuts this beautiful, you really don't need much more. I hope you're taking advantage of this Satur-YAY by getting your craft on! If you're craftin the day away, we'd love to see what you're making! Share it on social using #EllenHutsonSaturYAY so we can check it out. Thanks for stopping by today! I hope you've enjoyed this project and a look at the Alexandra Renke line! We're excited to have the Alexandra Renke line as a part of our product line up in the Ellen Hutson store. Happy Satur-YAY and until next time, I hope you have a fabulous day! You can watch this video in HD on our YouTube channel by clicking HERE. Don't forget to subscribe while you're there so you don't miss any of our card making and paper crafting video tutorials. Check out these talented makers & have fun hopping! What kind of embossing powder? There are so many brands & types of embossing powder, how do you choose what kind to use? Here at EH we think embossing powder is a bit like ice cream, there are so many flavors and they are all good but everyone has their favorites! Embossing powders come in different grades, finishes, colors, etc. Grade is a reference to the size of the powder granules. Finish is the appearance of the melted powder. Transparent: these powders will be affected by the color underneath. We've created a handy reference chart for you that includes the brands we currently carry at EH and their features. Good Wednesday morning and welcome to the CLASSroom. 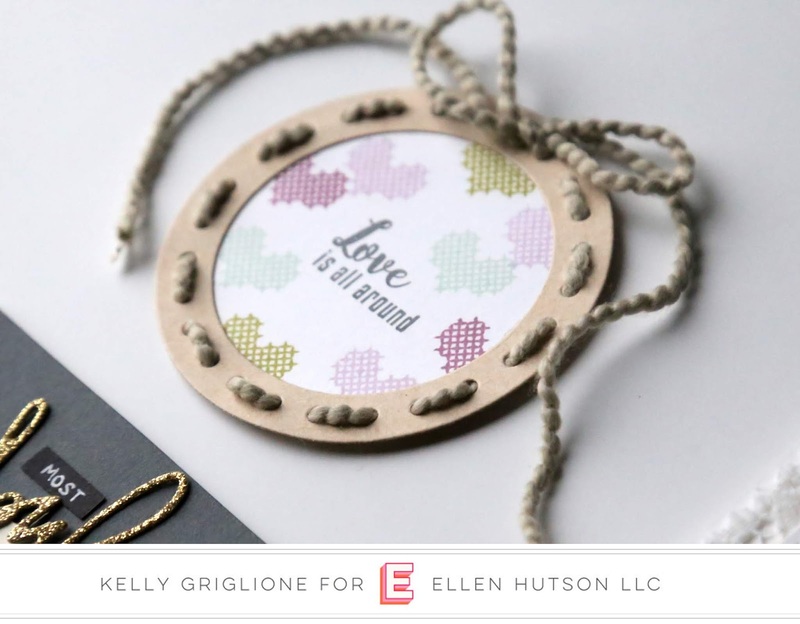 My project today was made using the Essentials by Ellen Thistle die set paired with the Impression Obsession Ornate Oval Frame and the Lawn Fawn Fancy Scalloped Rectangle Stackables. I have been having fun lately looking for new and different ways to use die sets that I already have in my stash. I love the shape of the leaves and branches in Julie's beautiful Thistle set and thought they would be so pretty used to create a floral arrangement. I used my favorite coloring technique of applying Distress Inks to the die cuts using mini applicators and then enhanced the color by heat embossing with clear embossing powder. Apply Shabby Shutters and Peeled Paint to the branches and stem of the flower images using a mini applicator. Apply Spun Sugar to cover the whole base of the flower. Apply Picked Raspberry and Fired Brick ink to the flower starting at the bottom and working up towards the center. Hint: Each time I touch the mini applicator to the ink pad I dab it off a little on scratch paper before I touch the die cut. This step allows for more even ink blending. Lightly apply darker ink to the edges of the flower to add definition. Place all the images face down on the Versa ink pad and press down to get good coverage. Apply clear embossing powder. I use Ranger Super Fine powder because it creates perfect coverage for delicate images like these flowers. Finish by applying heat to all the images and watch how the colors seem to come alive and become more vibrant. Apply mounting tape to the back of the scalloped layer and frame, attach them to the card base and begin assembling the arrangement. Start the arrangement by creating a base with branches, tuck them in behind the frame and attach with glossy accents. Secure the taller flowers in place first using glossy accents and work forward attaching the flowers and branches until the arrangement is complete. I hope you have been inspired to color some of your favorite die images and enhance the color by heat embossing with clear embossing powder. It truly is an amazing transformation. 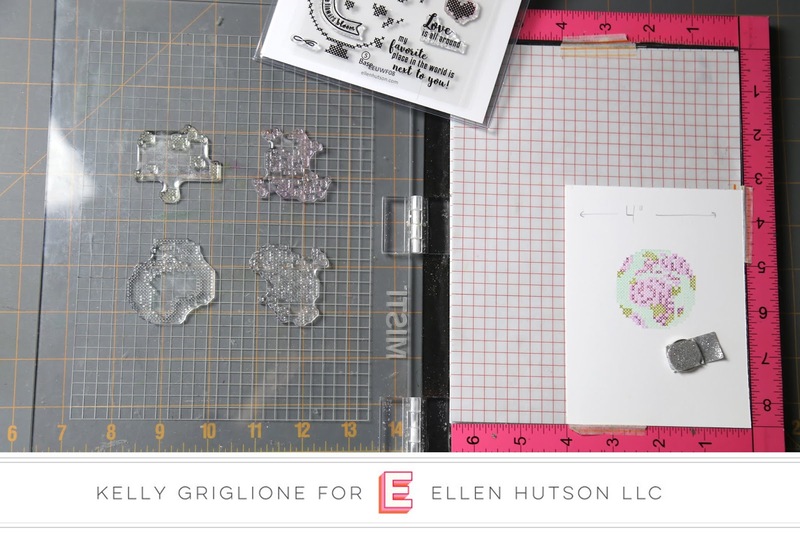 Let's talk about heat embossing - what is it, how you do it and what supplies you need! 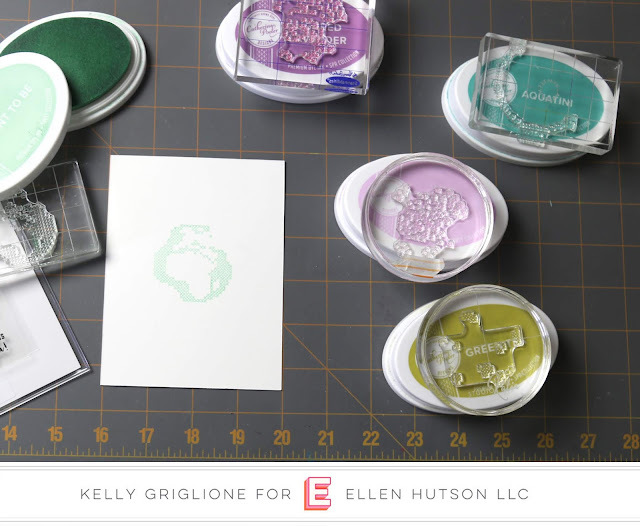 Heat embossing is a fun way to add dimension to your stamped images! Images are stamped in slow drying ink and the embossing powder is sprinkled on top. The powder sticks to the wet ink and then is melted with a heat tool to produce a smooth, raised image. Julie Ebersole calls it "magic on paper"! How do you heat emboss? Please ask us any heat embossing questions you have in the comments below and visit us again this week for more embossing fun! 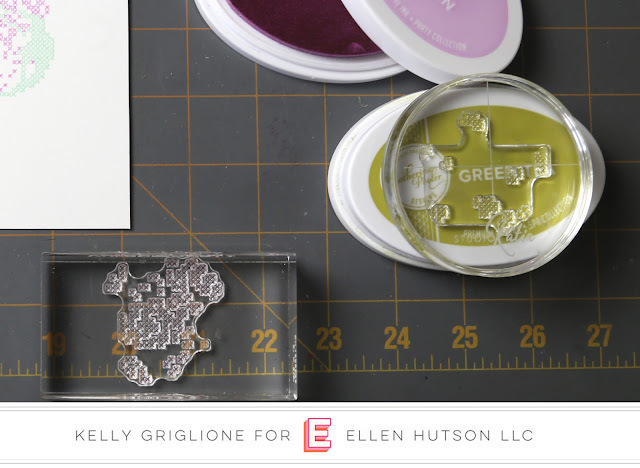 Tomorrow Kittie has a beautiful embossing technique to share and Thursday we will be talking about types & brands of embossing powders! Today is the big day! We are excited to be part of this exciting event. 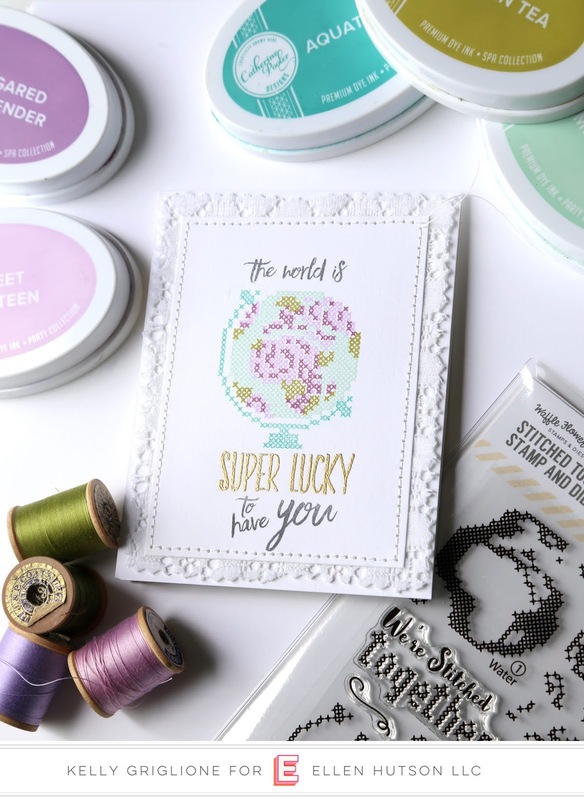 We have partnered with 17 other stamp and papercraft companies to do a special blog hop and will be giving away 18 prizes to 18 lucky winners! Ellen Hutson LLC ----> you are here! 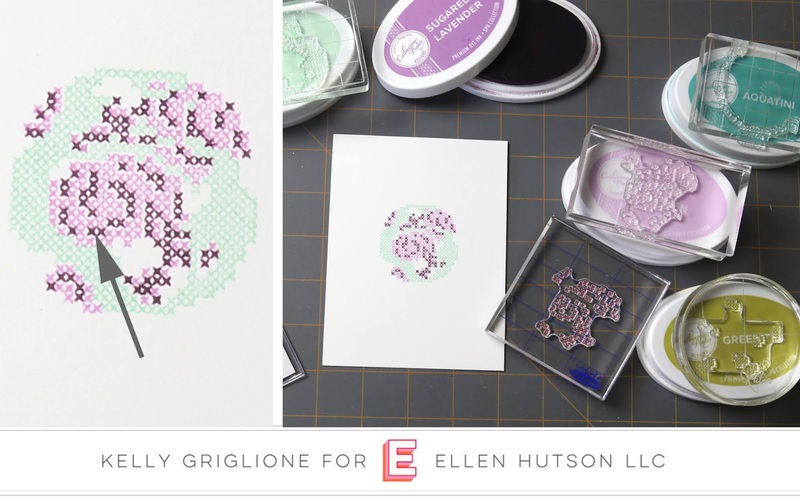 Julie will be LIVE tonight on the Ellen Hutson Facebook Page, at 7:30pm PT with an embossing technique demo showcasing the project below. Judikins Embossing Powder Sticky Stuff, 0.5 oz. Ranger Sticky Embossing Powder, 1 oz.